Many Americans are concerned about the Obama Regime’s bringing patients infected with Ebola into the country instead of treating in situ in already plague-ridden areas of Africa. While their concerns are quite valid, Ebola isn’t especially contagious and, hence, may not pose anywhere near the level of threat to the American public as other “diseases” of African origin which are already endemic within our borders. On the other hand, this may not be a completely fair comparison. 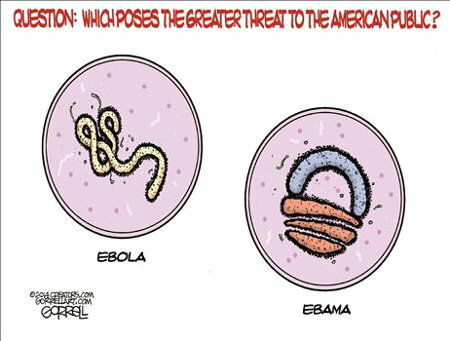 Ebola is a virus while Obama and his constituency and followers are a parasitic infection – one that resulted from Americans falling into slovenly housekeeping practices. This entry was posted on Saturday, August 9th, 2014 at 6:13 am and is filed under Humor, Politics. You can leave a response, or trackback from your own site.